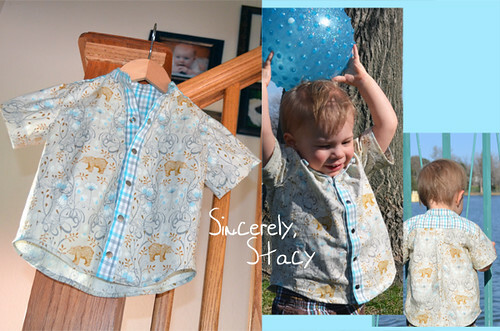 Sincerely, Stacy: Kids Clothes Week Project Complete and Broken In! Kids Clothes Week has come and gone (and was so inspirational). I completed this project for my little man, and he broke it in on the same day, spilling on it, getting lots of hugs from friends during a music event we attended yesterday, and giving it some good little boy wear and tear. I knew I had to make the shirt when I saw this fabric. And this is the first time I've sewed a shirt; usually when it comes to clothes, I do vests, so this was a great learning experience. There was a lot of technical learning here, including shirt yokes, placards, and gather stitching and easing to sew the sleeves, not to mention basting for new reasons I had not done before. It was nice (and fun) to learn a lot of new things doing a small version shirt before a big one, which I'd like to do for my husband some day soon. Already took him to the fabric store to see what fabrics he liked. Hehe. Looking forward to sewing more clothes in the future.